you haven’t been able to find an important document? you couldn’t check the details of a contract when the secretary had a day off? you didn’t know the correct headed paper for an H&S directive? you couldn’t inform a customer about the current state of processing of his complaint? 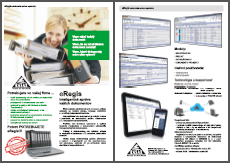 About eRegis, or what are the benefits of electronic document management? First and foremost, you can have all your documents at hand. Because eRegis is much more than a mere replacement for your post book – it is an intelligent, web-based software tool for offices and firms, making document flow management a lot easier, and it covers all the requirements of document registry legislation in the Slovak Republic. You can record various information about each document (metadata), you can append electronic attachments to documents (faxes, scans, or e-forms of documents), and you can access eRegis at work, from home, while travelling on business, even on holiday, via the screen of your desktop, notebook or mobile.